Muslim-majority countries: The falling out of Khomeini and the Tudeh (communist) party created bad relations. For a recent example: If one opposes the Islamist AK Party (Adalet ve Kalkınma Partisi) in Turkey, one votes for a leftist party. The West: Michel Foucault's delighted response to an actual revolution brought the two together. For a recent example: The Socialist Party in Belgium now relies heavily on Muslim votes. Morocco: Important elements of the socialist party, l'Union Socialiste des Forces Populaires (USFP), and of the Islamist party, Partie de justice et developpement (PJD) are trying to work together against the monarchy, reported La Gazette in July 2008 (and pointed out to me by Farid Hajji of Germany). Abdelilah Benkirane, secretary-general of the PJD announced that "L'alliance avec les socialistes de l'USFP est même souhaitée par tout le monde au sein du PJD" ("Everyone within the PJD hopes for an alliance with the socialists of the USFP"). Lahcen Daoudi, another PJD leader, added that the two parties have found "plusieurs points communs qui peuvent constituer une base pour l'élaboration d'une plate-forme de travail" ("a number of commonalities that can provide a base to build a common platform"). 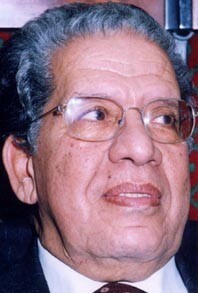 Mohamed Elyazghi, first secretary of Morocco's socialist party, USFP. In reply, Mohamed Elyazghi, first secretary of the USFP, announced that "Jamais, l'USFP n'a fait de l'intégriste PJD son ennemi juré" ("Never has the USFP made the PJD its sworn enemy"). To the question, could there be a rapprochement with the PJD, Elyazghi did not mince words: "tout est possible" ("everything is possible"). Il est de ce fait impossible, que ce soit pour le PJD ou pour l'USFP, qu'on travaille ensemble. Ceci est en fait inimaginable. Les bases d'une telle alliance sont inexistantes, sauf si l'un des deux partis change de positionnement. This makes it impossible for the PJD or the USFP to work together. That is unimaginable. The grounds for such an alliance do not exist, unless one of the two parties changes its positions. find common cause in the struggle to end the 27-year reign of Egypt's president, Hosni Mubarak. Promoting their message through blogs ­ like hundreds, if not thousands, of other young political activists ­ they agree that Mr. Mubarak, 80, must go and that Egyptians need to end the historic animosity between Islamists and secular democrats that has bitterly divided Arab politics for a century. Mr. Naggar, 29, and Mr. Sherif, 23, became acquainted through their Web sites and describe themselves as newly found friends. Interviewed in cafes on opposite sides of Cairo, they displayed remarkably common sentiments, given their distinct roots. "We must reach a middle ground," said Mr. Naggar, a dentist. "We need to understand that to achieve democracy is more important than holding on to old ideologies." His blog is decorated with an olive branch and often features a photo of someone praying. "We can't be always antagonistic," said Mr. Sherif, a government computer technician. "I think democracy can respect the beliefs of the people, so long as the beliefs are not imposed." His blog is adorned with the clenched socialist fist. Both young men reject Islamic rule in Egypt. Naggar: "Better to have a civil state with Islamic references." Sherif: "We have to recognize that Egypt is majority Muslim and increasingly religious." They also agree on a model that could work, the AK Party in Turkey. Revolutionary socialist Sherif allows that "It has been successful in Turkey and would be even more successful in Egypt. The party respects the religion of the people but also responds with laws that the people want." 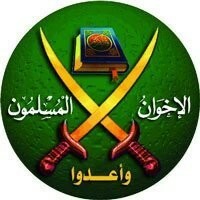 Logo of the Muslim Brotherhood. For its part, the Muslim Brotherhood will have nothing to do with this reach across the spectrum. "They can talk all they want; the Brotherhood will not change," says the brotherhood's 80-year-old supreme guide, Mohammed Akef. Turkey: Susanne Güsten in "Pious Turks Push for Labor Justice" tells how some Islamists are losing patience with the AKP's "capitalism with ablutions." After almost 10 years in power, Mr. Erdogan's ruling Justice and Development Party, or A.K.P., is coming under pressure from a new generation of Muslims calling for more social justice and democracy, in a trend that could change Turkey and offer new perspectives to societies in the Middle East searching for ways to combine Islamic values with a modern pluralist state, analysts said. The article quotes Murat Somer, a political scientist and expert on political Islam at Koç University in Istanbul: "The A.K.P. was born of the marriage between moderate Islam and global capitalism. The younger generation of some Islamists has a different take on social justice. They focus more on economics and a class-based understanding. There is a basis for this movement. It did not come out of nowhere."